These four, they are a team. They are a little gang of small people, the leader often changes as do the dynamics and my gosh do they like to squabble but underneath it all is a friendship that nothing will break. They have their own personalities, strong opinions and unique perspectives but together they are strong and I love watching the way they react to each other. This was just an ordinary half term day but we had no plans and the sun was shining so the beach seemed like the obvious choice. Ed was working and so it was just this gang and I which always prompts comments every few metres as we walk to the coast about 'having my hands full' (I totally do!). We had the wagon packed with buckets and spades, water and swimwear and we had nowhere else to be. I think the freedom of the beach always puts them in a good mood. The sea and sky seem endless, there is nobody showing them how to play or what to do, they are just given tools and left to create their own games. I think their favourite at the moment has to be throwing rocks into the sea. 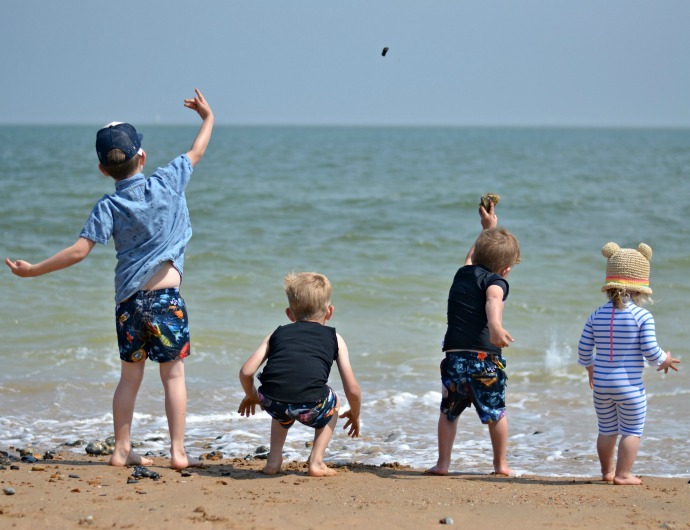 I will never understand how it can create so much enjoyment and entertain them for so long, but they can't resist the temptation of throwing and watching their rocks splash in the cold British sea. They run in and out of the waves, kick the water in the air and splash with their fingers and they smile and laugh as they do it. The day wasn't all perfect, but this moment was and looking back, that is what I want to remember. The way the big two competed, both thinking they had won, the way they encouraged their younger siblings, showing how to throw underarm, and the way they praised them for trying. The way they giggled as they did it, Archie doing a silly dance in between each throw. The way Cora counted rocks 'three, three, three', the way Dylan checked them all thoroughly to find the best ones and the way Finn picked only the biggest ones, telling me he was so strong every time he lifted one. As much as I love recording the big moments and the milestones, I wanted to make more of an effort to write down the little ones too and I hope one day the children can look back on the memories we made and remember the fun of their childhood.